Archadeck of Austin creates a cozy and contemporary outdoor space to enjoy day and night! Part of what makes my job so rewarding is the transformation process. This process goes beyond transforming an aged, or less than functional outdoor living space into a beautiful asset to the clients’ home and property. The reward comes from reading the excitement and satisfaction on their face and knowing the enjoyment they will get from the new outdoor living space for years to come! This is exactly the kind of project our recent transformation in Austin was. 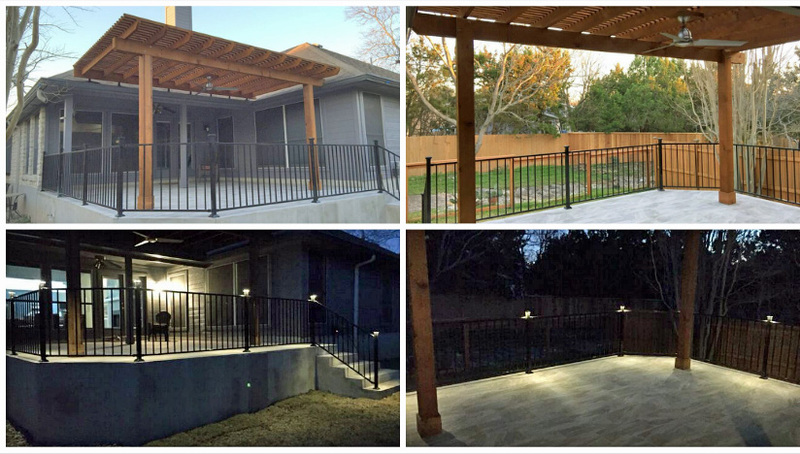 Archadeck of Austin turned an outdoor area consisting of an aging wooden deck into a cozy, contemporary patio that promises day and evening outdoor living. After meeting with the homeowners’ and discussing their desires and needs we went to work on a design that would compliment their home and allow them to partake in the outdoor lifestyle they craved. The new design includes a tile covered patio, inviting steps, and iron railing and is loaded with upscale, contemporary style. 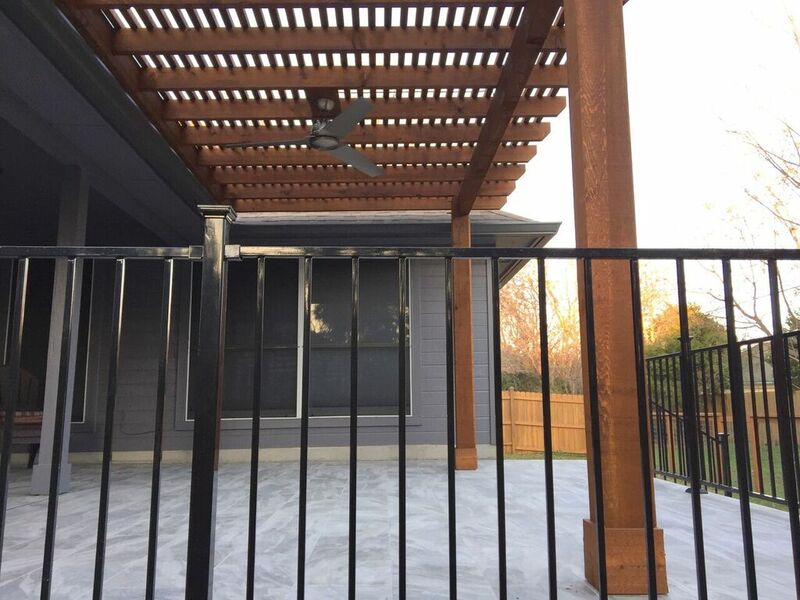 During construction of the project the homeowners’ also decided to add the pergola and replace two wooden gates on each aid of the yard access. The gates on both sides of the house were old and in disrepair. 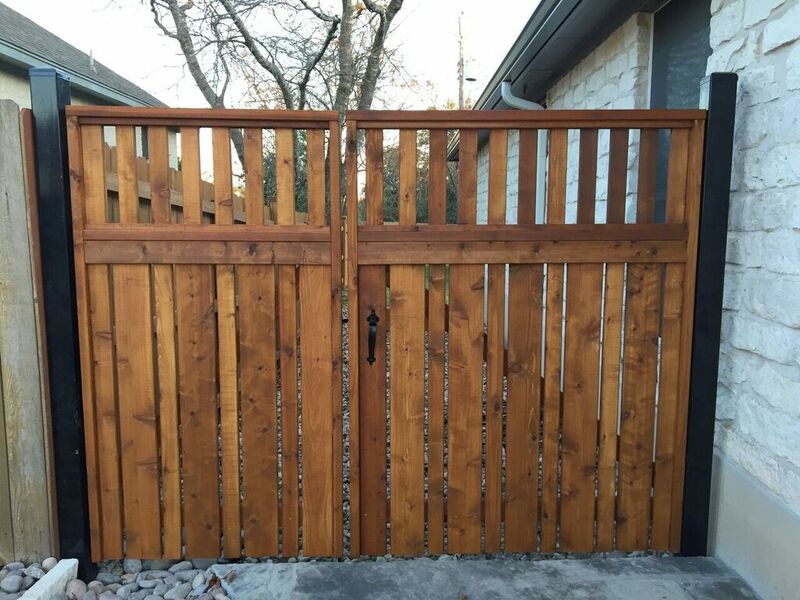 The client asked us to design an attractive center opening wide gate design with powder coated metal posts, cedar deck boards mounted vertically in an interesting pattern. The slab was a little over two feet above grade and was poured flush with the existing patio and attached via rebar doweled into the foundation. Provisions were made prior to pouring the foundation for the low-voltage lights and the electrical connection for a ceiling fan to be placed under the pergola. The client’s chose a Madison Silver porcelain tile in rectangular pieces which were laid over the new surface and existing patio. A tile schluter was used to avoid cracking of tiles between the new and old patios . 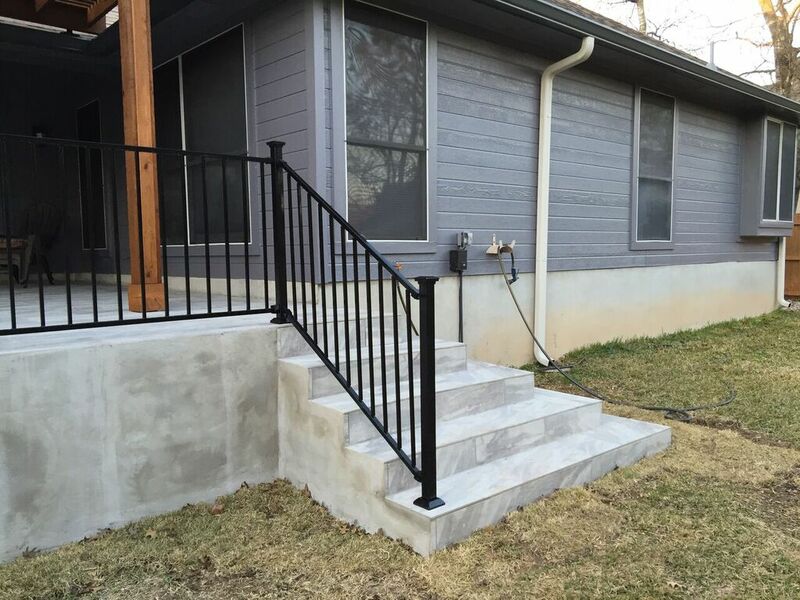 The sleek railings are Fortress rails with LED Fortress post cap lights. The addition of lighting added to the times the homeowners’ can now enjoy their new space, without limitations and bathed in ambient light! The pergola is built from western red cedar with a bracket attached at the roof fascia. In addition to the changes made to their outdoor living space, the clients’ also replaced all their existing gutters and repainted the entire house to compliment the tile choice — a total transformation indeed! 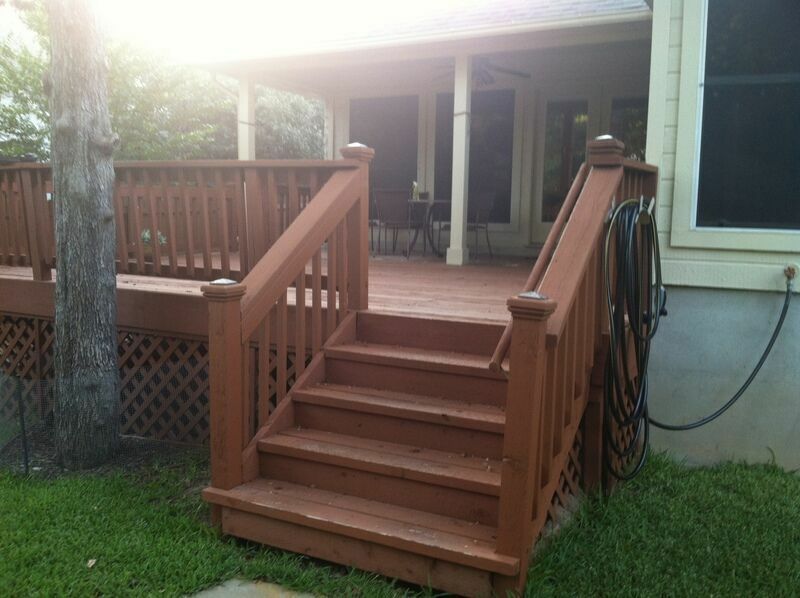 If you are envisioning an outdoor living space transformation in your near future, contact Archadeck of Austin. We can plan, design and build an outdoor space for you that will not only improve your outdoor experience but, we can create an area for you that make a design statement as well. Call for a free consultation at ( 512) 259 – 8282 or email us at jim.odom@archadeck.net. This entry was posted on February 10, 2016 by austinporchandpatio. It was filed under Archadeck of Austin, Austin patio cover, Covered patio Austin, Outdoor rooms, Patios and Hardscapes, Pergolas and was tagged with Archadeck of Austin, Archadeck of Austin design, Austin outdoor room, Austin patio builder, Austin Pergola Builder, Austin TX outdoor living space transformations, Madison Tiles, Unique patio designs Austin TX.